The 2012 Luneta Open Rapid Chess Championship was held on 28 April (Sat) at the Luneta Lapu-Lapu Plaza, Rizal Park, Manila . 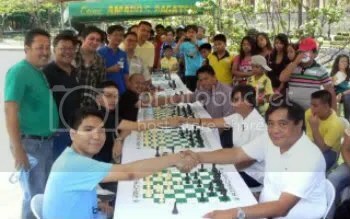 The organizer is the Rizal Park Chess Foundation. The tournament format was a 7-round Rapid Swiss System participated by 123 players [30 rated (7-GMs, 4-IMs, 2-FM) and 93 non-rated]. GM Wesley So won a clear first place with 6.5 points (6-wins & 1-draw) , half a point ahead to 2nd & 3rd placers GM John Paul Gomez and Nelson Mariano III both with 6.0/7 . SO Wesley 6-wins was against FULCHER Steaven Crenz(R-1), CO Marc(R-2), MARIANO Nelson III(R-3), GM BARCENILLA Rogelio(R-4), PARAGUA Mark(R-5), GARCIA Jan Emmanuel(R-7) and a draw with GM GOMEZ John Paul in R-6 for a 6.5/7 record . He pocketed P15,000 the top cash prize to the champion. This one day tournament is a good warm-up training for GM Wesley So and the rest of NCFP players who will be participating in the 11th Asian Continental/Individual Open Chess Championships scheduled 4th to 14th May 2012 at The First Hotel, in Ho Chi Minh city, Vietnam .